One of the big problems we see with clients’ campaigns is that they have keywords (or groups, or whole campaigns) that have excessively high bounce rates. Those should be taken out behind the barn and shot, but how do you separate the bad ones from the good ones? Analytics makes it easy! Connect your AdWords account with your Analytics account. Wait until you have a bit of history in Analytics, at least 10-20 clicks on the keywords/groups you’re checking. Click into the ‘Traffic Sources’ section in the menu at the left. Click into the AdWords section. If nothing is shown here, you haven’t connected AdWords and Analytics correctly. Choose the campaign you’re interested in. Now you’re looking at how that campaign’s ad groups have performed on your site. One of the questions we get often is “what’s a high bounce rate?” Unfortunately, this depends on your site, your visitors, your market, etc. But Analytics gives you a great way to see how AdWords traffic compares with average traffic. On your Analytics page, find the ‘Views:’ selector on the right side. It defaults to ‘Table’, but the option we want is ‘Comparison’. Click it and you’ll see how your ad groups’ visits compare with average. This isn’t terribly useful, but click the pulldown next to ‘compared to site average’ and select ‘Bounce Rate’. 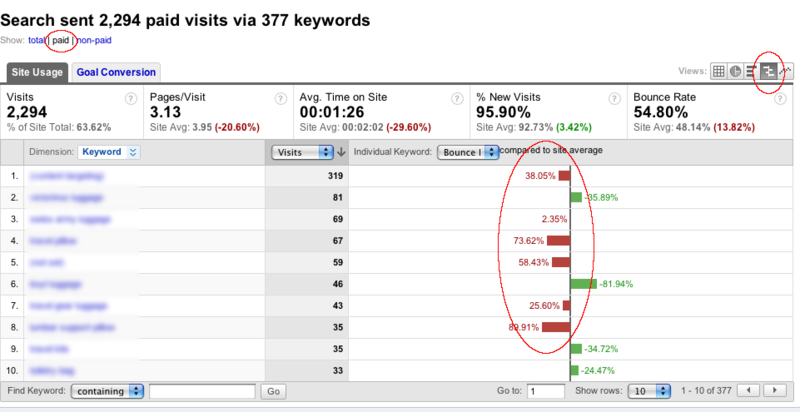 Now you can see your bounce rate for each ad group relative to your average bounce rate for the site. Ad Groups that are bouncing higher than average need to be examined for problem keywords or ad text. Another way to slice the data is to ignore campaigns and groups, and instead focus on Keywords. Click ‘Keywords’ on the left side under ‘Traffic Sources’, then click the ‘paid’ link below the graph. Now you’re looking at just the keywords you paid for via AdWords. Again, use the ‘Comparison’ link over on the right side, then pick ‘Bounce Rate’ in the pulldown next to ‘compared to site average’, and you’ll see which keywords are bouncing a lot. Pause those in AdWords and stop spending money for clicks on keywords that aren’t performing! Adwords is really great for promoting your website and also affiliate links. i have just passed the Google Adwords Professional exam today and i am very happy. I have been using Adwords for the last 2 years and i can only say that it increased my online sales by about 20%. The pay per click cost of Adwords is even cheaper than Adbrite. I love Adwords. Hi. I’ve recently remastered my ads and ad groups. Thanks for this post which will help me know which are the poor performers, but I really don’t know how to improve them. If a keyword performs badly, would you suggest suspending it? I have keywords that I thought would perform well but don’t. The information that they don’t perform well in itself doesn’t seem enough as I don’t know why. What next?